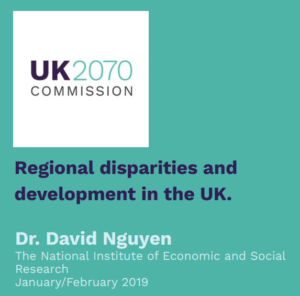 Our weekly series of Think Pieces continues today with our third paper, Regional disparities and development in the UK written by Dr. David Nguyen, a Research Economist in the Trade, Investment and Productivity Directorate at the National Institute of Economic and Social Research (NIESR). The report uses data to show how the UK’s regional disparities have varied over time from the 1960s to the present day; before seeking to model the ‘under-performance’ of regions in order to establish what a ‘spatially rebalanced’ region may look like. Dr. Nguyen comes to a number of conclusions, including finding that labour productivity differs across the UK’s regions – with 72% of the UK having an output per hour worked below the national average (NUTS-3 regions). Indeed, using data for regional labour productivity from the Office for National Statistic’s Gross Value Added dataset at a local authority level he finds that the absolute difference in regional productivity can vary by as much as 107 percentage points, from just 65% of average productivity in Powys to 172% above the national average in Tower Hamlets. However, Dr. Nguyen goes on to state that by definition regional disparities are relative, and that they are meaningless without a politically agreed benchmark. Combined with the question of whether both Greater London and the South East of England over-performs at the expense of the rest of the UK; or if indeed other regions of the UK are in fact ‘under-performing’, Dr. Nguyen adds that there should be a national conversation about regional economic performance. This conversation could focus on whether improvements should be compared against either national performance, or the long-term potential of the region itself. Dr. Nguyen is also a Research Associate for the Office for National Statistics’ Economic Statistics Centre of Excellence (ESCoE). His main research interest is to analyse, measure and understand modern economies, with his present work focused on improving measurements of GDP and welfare, focusing on the importance of intangible inputs in an increasingly digital economy (e.g. cloud services, AI, data).